The DigiSonic is a Windows application that turns your PC sound card into a fully functioning audio test set. Our family of test solutions, while all sharing a common concept and control layout, differ in terms of portability, precision, and features. Any Lindos user will instantly feel at home with the DigiSonic. Measures audio quality in terms of frequency response, noise, distortion, crosstalk, headroom, and phase. 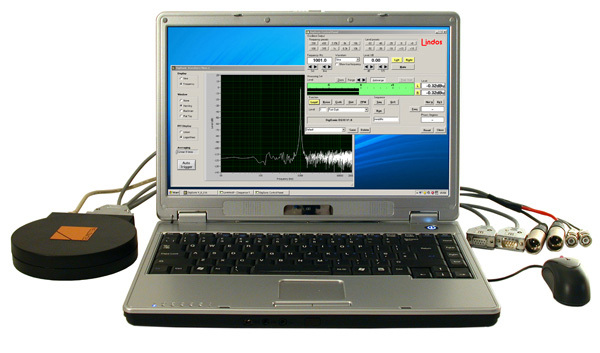 Full real-time spectrum analyser with windowing and averaging options. Sequence compatibility with the MS10 and LA100. Analysis segments providing graphs of level, distortion and phase against frequency, noise against time and headroom. Balanced and unbalanced analogue and AES3/EBU digital audio interfaces when used with a YellowTEC PUC. Remote control over the Internet. Digisonic DS10 running on a laptop with a USB soundcard. Results management, and tolerance testing. Precision two-channel level measurement (0.01dB resolution). Noise and distortion measurements with selectable weighting filters, including CCIR(IEC 268/ITU-R 468) and A-weighting. Selectable meter dynamics including Quasi-Peak, Fast Quasi-Peak, RMS and PPM. The DigiSonic can be operated stand-alone with its own control panel, or through Lin4WinXP in the same way as our hardware test sets. As well as providing a familiar interface across our family of products Lin4WinXP (free with the DigiSonic) provides access to the sequence testing facilities built into the DigiSonic. Sequence testing allows a user-defined series of measurements to be made by the DigiSonic with the click of a mouse. Synchronisation of the generation and measurement sides is achieved using FSK (frequency shift keyed) tones and full compatibility with the LA100 and MS10 is maintained. This powerful system generates a complete Lindos test report within 30 seconds and its standardised presentation provides a permanent record, a basis for comparison and a valuable accompaniment to any quality product. Sequence results are presented in Lin4WinXP with text and graphs on screen for viewing, tolerance testing, saving, printing and exporting to other applications. The graphs can be overlaid, customised, compared (sum and difference plots) and analysed point by point using the Graph Viewer. The intrinsic precision of digital levels, free from analogue attenuator errors, makes the DigiSonic the ideal choice for equipment calibration and production testing. Digital processing has enabled us to include swept distortion and spectrum analysis. Because the DigiSonic and Lin4WinXP communicate using Internet protocols, remote controlled lines and network testing can be centralised and automated. Security Dongle The DigiSonic is protected with a USB Dongle, each dongle has a serial number pre-programmed within it and the DigiSonic software checks that the dongle is present. When the dongle is not found an option to run the software in demonstration mode is provided. This allows limited functionality (tone generatation and level measurement are enabled). The resolution and accuracy of the DigiSonic's measurements are only as good as the sound card it's used with. It is therefore important to measure the sound card's performance before testing other equipment. There are many professional sounds cards available and there is no limitation on the type of card that can be used with DigiSonic. Remember if you find a good quality card you can let other users know by uploading the results to our online database. The PUC2 provides calibrated inputs and outputs and requires no supporting driver software. The PUC2 is a 24 bit card that supports sample rates up to 192 kHz device. PUC2s are available from us with AES3/EBU interfaces and balanced analogue interfaces.